This elegant volume is a scholarly, comprehensive survey of all aspects of the Arts and Crafts Movement, from its philosophical origins in Victorian England to its later manifestations in Austria, Germany, Russia, Hungary, Scandinavia and, of course, the United States. The author, a Senior Lecturer at Cambridge University, charts the course of the movement in all media, including painting, crafts, and architecture, and examines the theory and philosophy behind a variety of seminal pieces, including fine examples of work by C.R. Ashbee, Edward Bourne-Jones, Charles and Henry Greene, Charles Rennie Mackintosh, William Morris, Philip Webb, Gustav Stickley, the Roycrofters, and Frank Lloyd Wright. This lavishly illustrated (in color) book features extensive archival material, previously unpublished works, and groundbreaking new research. If you are looking for one comprehensive, authoritative text that explains and illustrates the Arts and Crafts Movement throughout the entire western world, this is the book to read and enjoy. Hardcover, 272 pp, see below to order. 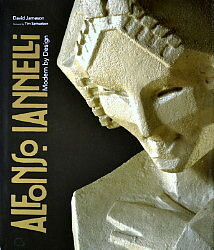 Who was Alfonso Iannelli? You will be amazed to learn the breadth and depth of this man's contributions to 20th century American art, architecture and design, spanning as he did the Arts and Crafts, Art Deco, and Mid-Century Modernist periods . As an eighteen year-old, this Italian-American immigrant apprenticed to Gutzon Borglun working on NYC's Cathedral of St. John the Divine. In 1914 Frank Lloyd Wright asked Iannelli, then twenty-six, to sculpt the striking geometric "sprites" for Wright's landmark Chicago masterpiece, Midway Gardens. Iannelli went on to have a fascinating career that extended well into the 1960s, from groundbreaking modernist posters for Los Angeles' Orpheum Theater to his zodiac figures at the twelve corners of Chicago's Adler Planetarium to iconic industrial designs that found their way into most American households (remember the Oster Drink Mixer and the Sunbeam Coffeemaster?). This book is exhaustively researched and beautifully illustrated with over 470 illustrations and photographs, many in stunning color. Hardcover, 364 pp, see below to order. This book is a beautifully illustrated history of the jewelry and metalwork industries in Chicago and the Midwest during the American Arts and Crafts movement. Building on Sharon Darling�s now-classic Chicago Metal-Smiths book published twenty-five years earlier, this book introduces dozens of new craft workers, companies and hallmarks, and corrects misidentified artisans, marks and information. The author�s research included dozens of interviews with family descendants; access to the original files for Chicago Metal-Smiths; newspaper and magazine archives; city directories and art directories; vital records, military and real estate archives, and the study of numerous collections. 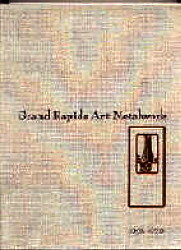 In addition to thorough treatment of Chicago-area metalsmiths, the author describes and illustrates the work of regional Arts and Crafts firms located in outstate Illinois plus Indiana, Iowa, Kansas, Kentucky, Michigan, Minnesota, Missouri, Ohio and Wisconsin. Hardcover, 288 pp, see below to order. Here is the updated and revised edition of David M. Cathers� ground-breaking book on American Arts and Crafts furniture. Originally published in 1981, this revised edition provides authoritative information on Gustav Stickley�s Craftsman Workshops, the L. & J.G. Stickley Furniture Company, and the Roycroft Shops. The book was the first to trace the style and, through a richly detailed text and over 200 illustrations, provide a means for identification, dating, and subjectively evaluating many individual pieces. This extensively illustrated book is an invaluable reference for anyone interested in the history of American decorative arts. Softcover, 256 pp, see below to order. This is another lavishly illustrated hardcover book by noted Grand Rapids authority Don Marek. Forest Mann, The Forest Crafts Guild, Stickley Brothers and the rest of the Grand Rapids school of design in metalwork, plus jewelry, metal lamps, and "Russian hand beaten copper" - it's all here. Hardcover, 144 pp, see below to order. Dirk van Erp was arguably the greatest coppersmith of the American Arts & Crafts movement. 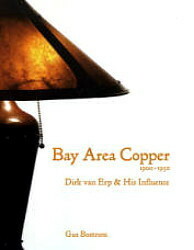 This scholarly book was published in 2012 to accompany an exhibition of the work of Dirk van Erp and other Bay Area coppersmiths in Oakland, California. The book is based almost entirely on primary source material using period newspaper articles, census data, and museum archives. The text is accompanied by many color photographs and illustrations. 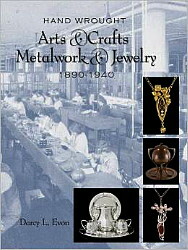 Besides an exhaustive treatment of Dirk van Erp, the book covers such other metalsmiths as Harry St. John Dixon, D'Arcy Gaw (van Erp's first partner in San Francisco), August Tiesselinck (van Erp's nephew), van Erp's children, William and Agatha van Erp, Lillian Palmer, Hans Jauchen and Old Mission Kopper Kraft, and several others. Softcover, 117 pp, see below to order. Published in late 2014 to accompany an exhibit of Dirk van Erp�s works in Berkeley, CA, this lavishly illustrated book details the life and work of Dirk van Erp and of his son William, based on primary source materials including family photos and archives never before published. 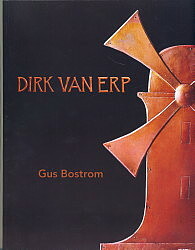 This is probably the most comprehensive book yet written about Dirk van Erp. Softcover, 165 pp, see below to order. This book was prepared for an exhibition held at Christies New York in the summer of 1987. The 200 pieces of American art pottery were selected from private collections of American Ceramic Arts Society members. The book is printed in full color featuring pottery by Grueby, Teco, Rookwood, Marblehead, Ohr, Van Briggle, and others. Dr. Martin Eidelberg of Rutgers University served as editor for the book. 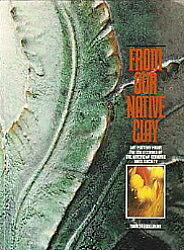 The book presents a series of essays by Robert A. Ellison, Jr. on the history, techniques, and aesthetics of American art pottery. The catalog descriptions were written by Betty Hut. Both new and experienced collectors will find this comprehensive and beautiful book a valuable addition to their Arts and Crafts and art pottery libraries. Softcover, 112 pp, see below to order. 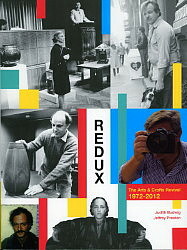 Redux is the groundbreaking social history of the American Arts & Crafts Revival, 1972 to 2012. It is the story of people who made the Revival happen: collectors, dealers, auction houses, curators, and writers who initiated, inspired, and propelled it. This movement was unique in place and time and in its philosophical basis. Certain individuals dramatically impacted the life and evolution of it. The book is based largely on primary sources-interviews, articles, and books. Softcover, 392 pages with 734 photographs, see below to order. Gustave Baumann (1881-1971), one of this country�s greatest Arts and Crafts woodcut print makers, began his career as an artist in Chicago. 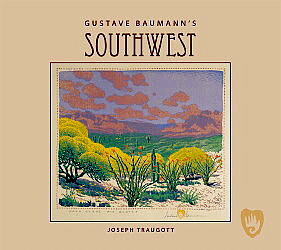 In 1905 at age 24 he took up traditional woodcut printmaking, and in 1910 he moved to Brown County, Indiana to make �good pictures at low cost.� Baumann later lived in the Northeast, but eventually settled in Santa Fe, New Mexico, where he created many woodcut prints of the American Southwest. Baumann wrote his autobiography as he was nearing 70 years of age. 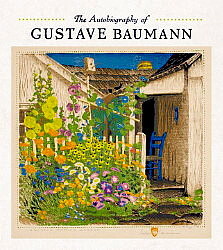 This amazing new book, edited by Martin Krause, Curator of Prints, Drawings and Photographs at the Indianapolis Museum of Art, contains anecdotes of Baumann�s town and family life and observations about society and the role of artists, interspersed with over 80 color reproductions of Baumann�s prints and over 30 photographs of homes and family. This is probably the best book ever published about Baumann and his entire life�s work. Hardcover 160 pp, see below to order. Early in his career, Gustave Baumann (1881-1971) lived in Chicago and spent time in rural Indiana, New England, and New York, but he found his true home in New Mexico. He moved to Santa Fe in 1918 and spent the rest of his life there. This hardcover volume presents over 50 color plates of the artists's woodblock prints and gouaches, with a scholarly essay by Joseph Traugott, PhD, curator of twentieth century art at the New Mexico Museum of Art. This book is a wonderful introduction to the life and work of this talented and prolific Arts and Crafts printmaker. Hardcover 80 pp, see below to order. William S. Rice (1873-1963) was one of the most gifted block print artists of the American Arts and Crafts movement. In 1910, Rice moved from Pennsylvania to the San Francisco Bay area where he found many of the subjects for his life�s work, but he also travelled through the Southwest, to Alaska, and to Europe. Wherever he went, Rice photographed, sketched and painted landscapes and seascapes, many of which became the basis of his block prints, etchings and other works. The author, Rice�s granddaughter, illustrates her scholarly treatment of her subject with over 300 illustrations, many full color illustrations of Rice�s paintings and prints, along with many black and white drawings and family photographs. A more thorough and comprehensive treatment of Rice�s life and work does not exist �this is the book to own and read and re-read. No wonder that Rice�s works are so collectible. [Note: Rice�s woodblock print, �Marsh Moon,� sold at Treadway Toomey Auctions on December 5, 2015, for $2125.] Hardcover 214 pp, see below to order.